It still needs to do more for influential creatives, though. Even though Apple makes a lot more money on iPhones and iPads, Macs are still crucial to its bottom line. For years, they were widely loved by creative folks and influencers because they were simpler and more powerful than Windows PCs. Now, content creation pros and designers are falling out of love with Apple. Many see the MacBook Pro's Touch Bar as a consumer gimmick, and worse, Apple's top-end laptops have failed to keep pace technologically with powerful, well-designed PCs from Microsoft, Dell and others. Many of Apple's most passionate fans are journalists, programmers and high-profile designers who are loud on social media when they like and dislike what Apple is doing. Such complaints have made it to the ears of Apple brass. Last year, VP Craig Federighi admitted that they "designed ourselves into a bit of a corner" with the Mac Pro, and vowed to release a model this year (it now says it won't come until 2019). The new MacBook Pros with eighth-generation Intel CPUs help, but many folks still aren't thrilled. The top-of-the-line model, which starts at $2,799, offers less than half the graphics performance of the $2,399 Razer Blade, for instance. But Apple also did something pretty canny. It unveiled a Thunderbolt 3 external GPU (eGPU) it co-designed with BlackMagic Design for $700, which is a reasonably competitive price next to other third-party models. It's a strong sign that it hasn't given up on the creators that are most passionate about its products. 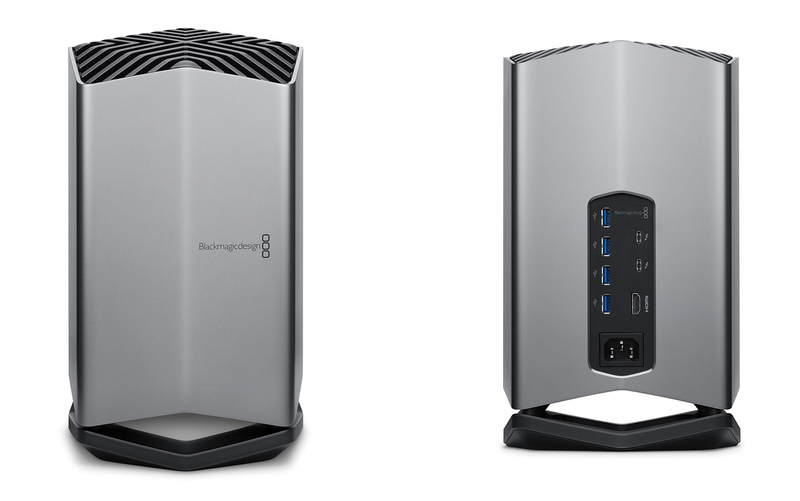 BlackMagic Design's eGPU connects to any Mac with a Thunderbolt 3 port, and packs a Radeon Pro 580 with 8GB of DDR5 graphics memory. That puts it nearly on par with NVIDIA's 6GB GeForce GTX 1060, and the extra 2GB is hugely valuable for 3D modeling and other productivity chores. It also doubles the performance of the Radeon Pro 560X in the latest MacBook Pro, and since the same card is used in the 27-inch iMac, driver support should be rock-solid. The Thunderbolt 3 connection will let you plug in LG's Apple-approved LG Ultrafine 5K display, BlackMagic says. On top of that, you get four USB3 ports, two Thunderbolt 3 ports and an HDMI 2.0 port, letting you plug in a 4K monitor and other accessories, and even charge your laptop. It should work with any MacBook Pro released after 2016. Attaching the box will significantly boost the horsepower of a MacBook Pro, but there are a few notable downsides. The most significant is that the Radeon Pro 580 card inside the eGPU can't be upgraded, so in a couple of years the box might seem doggy compared to the Radeon Pro 680 or whatever comes along next. So who should buy this? If you want to own a MacBook Pro and use video editing and graphics apps like Premiere Pro CC, Final Cut Pro X (with a big caveat, see the update below) and Blackmagic's own DaVinci Resolve 15, then it should be on the front of your mind. Blackmagic Design, for one, said the eGPU can speed up tasks like spatial noise reduction by up to seven times. It will also make GPU-intensive tasks like gaming and virtual reality work better, too. Support for those tasks is notoriously poor on macOS, so every little extra bit of performance you can eke will help. Apple first offered macOS eGPU support earlier this year, and there are a number available, like the ASUS XG Station Pro model. It costs $329, not including a graphics card, so you'd be looking at about $630 including the Radeon Pro 580 card, just shy of the price for BlackMagic's eGPU. However, the latter includes many more ports and a far more polished design. It is also sold directly by Apple -- a strong appeal for Mac buyers. Apple didn't stop there with the new MacBook Pros. You can now add up to 32GB, instead of 16GB of RAM, which is also a must for content creation apps, and the eighth-gen CPUs will also significantly boost rendering and other tasks. With redesigned keyboards that hopefully won't break, the MacBook Pro is again a viable creation tool. The eGPU and new MacBook Pros are a good start, but Apple still has a lot to do. For the price, the MacBook Pro remains underpowered next to Windows machines, particularly when it comes to graphics. And macOS needs work under the hood so that software like Adobe Premiere Pro CC works as well on Mac as they do on PC. Oddly, Microsoft is even stealing Apple's design thunder with more interesting models like the Surface Book 2 and Surface Studio all-in-one. Apple has stuck with more or less the same MacBook design for the last decade, and badly needs to refresh it to keep up. Although Apple didn't design the new eGPU, it struck me as as a breath of fresh air for the stodgy lineup. 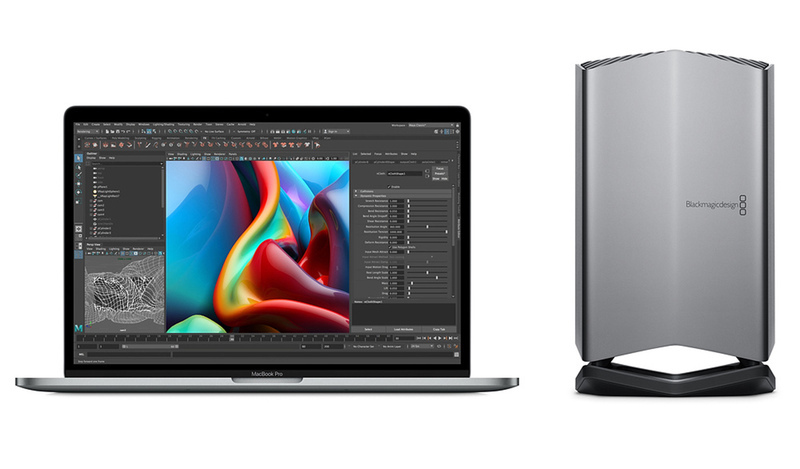 If Apple can't or won't refresh its MacBook lineup to the same standard as Windows models, it'd do well to team up with Blackmagic or other third-parties on equally interesting products that can help creatives. Many of those people are willing to pay a premium for products they like, so it would be a shame for Apple to lose their business -- and cheerleading -- to a key competitor. Update: As Twitter user @d_zone and others pointed out, Apple's own Final Cut Pro X video editing program won't benefit from any external GPU unless you run a user-created script called Set-eGPU. Even then, you'll lose some speed benefits compared to a built-in GPU or card. This is a pretty big whiff by Apple, so we've reached out to see if the company plans to rectify that soon.